Digital imaging systems today combine traditional copy functions with advanced document handling capabilities. Output speeds from 13 pages per minute to high volume production capability of over 105 pages per minutem in B/W and Colour. Advanced finishing capabilities can make systems full publishing tools with the ability to staple, 3 hole punch, saddle stitch and create booklets automatically. Many devices will support scanning, or image capture in B/W or colour. Add advanced fax capabilities available. Considerations for choosing the right solution for your business are broad. Multifunction printers - copiers become a digital onramp to scan and index your important information and turn your paper documents into managed digital document content. With the capabilities for customizing the interface of MFP devices it is possible to integrate many specialized software components or Apps which improve the productive use of the equipment. Link to your DropBox, Sharefile or Google Drive. Connections to ERP & Accounting software, document routing software, custom workflows, OCR and AP capture automation and other tools can be integrated with the MFP you acquire. Ask your consultant to outline how to expand the value of your package through these advanced Apps and tools....some are bundled or free and many available at limited additional cost. Categories of multifunction printers - copiers. Each page includes links to brochures providing more information on our 'best of breed' choices of manufacturers brands. For help in configuring and to obtain more specific information feel free to contact our document solutions team at sales@leppert.com or through the contact information above. Our approach is to discuss your needs first....and match them up with the right solution from a wide choice of opportunities from our world class partners. The modern office uses colour in a variety of ways. Colour laser technologies provide the opportunity for more offices to afford qualtiy colour documents. Available from 15 ppm to over 80 ppm. Colour Multifunction printers - copiers as well as stand alone printers can meet the demands of monochrome printing and provide colour capability as well. Save 30-40% operating costs on your colour print devices with out tiered colour plans: stop overpaying for colour and you only pay for the exact amount of colour you use. Advanced fax systems now provide network faxing capability as well as links to the internet if desired. Using faster modems, larger memories and higher quality scanning output is improved. Of course many multifunction printers offer fax capability as well. 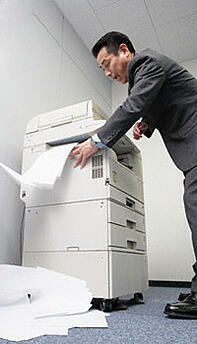 In fact often the most robust fax tools are available through these devices rather than stand alone fax. Fax forwarding: automatically capture incoming faxes and route these as PDF attachments to an email user (such as your receptionist) or automatically archive them to a shared network folder. At times smaller multifunction devices have taken over the role of dedicated fax do to lower cost compared to dedicated fax devices. Discuss your fax options with one of our Client Service Representatives for the right choice for your needs. Call us for your service needs. We are here to solve your MFP, Multi-function Printer or Postage Machine service frustrations.